Intermittent fasting has been around for quite awhile. Bodybuilders and fitness models keep it shrouded in secrecy to help sell expensive supplements and replacement meals by the companies that sponsor them in competitions. This easy diet plan to lose belly fat and get rid of thigh fat puts the spotlight right on this uncomplicated and non-controlling healthy nutritional program. If you have been discouraged by failed diets in the past, if you are tired of Yo-Yo dieting and the resultant weight gain, or if you have been looking for a program to help you look better in a swimsuit or shorts...this may be for you. Brad's simple diet plan centers on three areas: (1) Establishing a calorie-deficit through 24-hour intermittent fasting (2) Moving more - you will be expected to walk or engage in 20-30 minutes of continuous activity (3) You must commit to some weight training in order to build lean muscle that speeds up your metabolism. Intermittent fasting means you will fast for 24-hour periods, on non-consecutive days, and you will eat everyday. Let's say you decide to start fasting after a normal (not a piggy meal) dinner at 6:00pm on Monday. You will fast until 6:00pm on Tuesday, then eat a normal dinner. You will wake up on Wednesday and eat a normal breakfast, lunch, and some healthy snacks...then start fasting again (if you choose) at 6:00pm until 6:00pm on Thursday. You will stay hydrated and do your normal cardio/weight training workouts. You are NEVER in starvation mode to foul up your metabolism because you are eating something everyday...yet at the end of the week, you have reduced your caloric intake by 3000-3500 calories and will be losing fat. * This simple diet plan is not for people who want to lose "15-20 pounds in a week." (Real unhealthy) It is for the person who wants to progressively lose 15-20 pounds over several months and sustain their fat loss. * Brad's program is not for people who decide they are entitled to frequent "cheat days" or those who want to lose belly fat by using pills and not doing anything physical. * If you do not like moving or ongoing exercise, this program will not work for you. There are plenty of websites that will take your money and give you empty promises for belly fat loss. * Intermittent fasting takes some getting used to...especially if you have been eating unconsciously for several years. In a nutshell, the Eat Stop Eat download is for those women who want an uncomplicated and non-restrictive simple diet plan. It is for those who have the self-discipline to commit to a more healthy lifestyle, will make intelligent food choices, workout regularly, and understand how unconscious eating can sabotage you goals for lifetime fat loss. 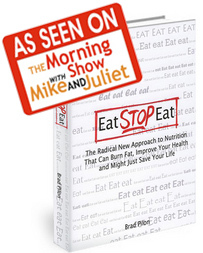 If you have been looking to make a simple, but effective change to lose belly fat, if you have wanted to look better and feel better about the way you look in shorts or a bathing suit, Brad Pilon's easy diet plan in the Eat Stop Eat download may be for you.